Silly Thing in partnership with Medicom Toys has announced a new set of 1000% upsized Kubrick’s based on the world’s most popular band of all time; the Beatles. Called the “Can’t Buy Me Love” set, these Kubricks are going to be limited, rare and expensive. Infinitely influential to contemporary pop music and generations of musicians, The Beatles continues to change the visage of pop culture and contemporary culture for decades on end. Their uber famed single ‘Can’t Buy Me Love’ anchored top of the charts in both the U.K. and U.S. immediately after its release in March 1964. SILLY THING proposed the ‘Can’t Buy Me Love’ 1000% Kubrick project to Medicom Toys and The Beatles around two years ago, and it is not until winter 2008 that it has come to its final stage. The plan sees the four members of The Beatles (John Lennon, Paul McCartney, George Harrison and Ringo Starr) shaped into stylised creations of 1000% Kubrick oversized figures. 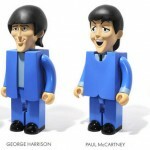 With the 680mm height, they could be the biggest The Beatles collector’s toys ever. At a time when the crossover of pop culture and art are more and more recognized, The Beatles ‘Can’t Buy Me Love’ 1000% Kubrick Set makes a delightfully light-hearted investment. You can place an order for this set Here. Random nitpick: The band was the "Beatles", not "Beetles", which are a type of insect with a hard carapace that protects their wings. A neat concept, although Kubricks are really my thing. Y'know, I would pay good money for 'real-life' Beatles figures. The early/mid '60s suit and tie look, the Sgt. Pepper outfits, late '60s hippie look, anything, everything. I bought both waves of the McF Yellow Submarine figs, but passed on the later animated figs. I don't get the whole Bearbrick thing, so these have no appeal. NECA did a non-Beatles Lennon a while back, and you would think he'd have the hardest likeness rights to acquire. Is Ringo holding out or what?